Beinn Narnain, which sits above Arrochar at the head of Loch Long, is a rocky topped hill. 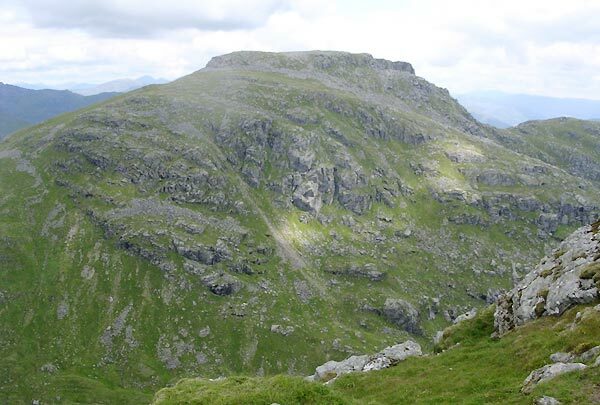 It has three ridges, a short broad ridge WNW to Bealach a' Mhaim connecting to Beinn Ime and Ben Arthur, a long knobbly ridge NE to A'Chrois (848m), which is not a usual ascent route, and a craggy SE ridge. 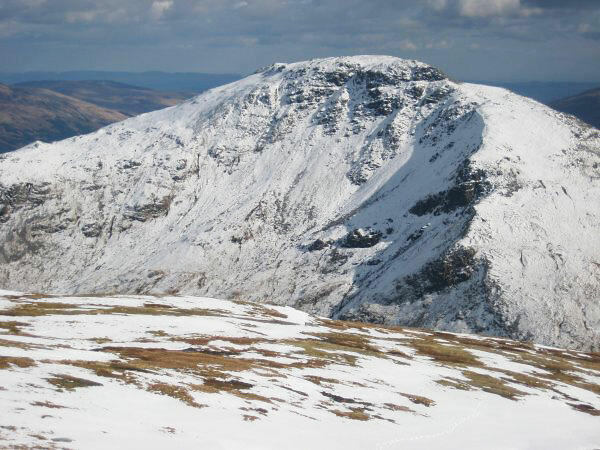 The direct ascent route from Succoth leads to the SE ridge and this route takes you over and through rocky outcrops (not really scrambling) to the flat stony summit. Views across to Beinn Narnain looking south from the slopes of A' Chrois. 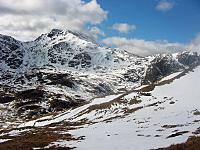 The summary information of one or more ascent routes that include Beinn Narnain. 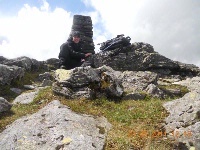 1 1550 m 12.92 km 5.5 hrs Beinn Ime and Beinn Narnain A strenuous climb, from sea level, on relatively steep slopes but no scrambling required. At the top of Narnain! 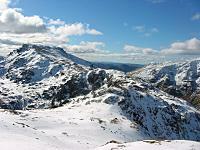 Post a few words about Beinn Narnain or read what others have had to say. 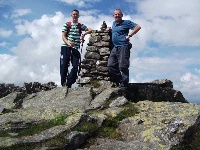 Family and friends climbed this in sensational weather. This is a really good hill with interesting and varied terrain. There are no difficulties and the final accent in amongst the craggs is really enjoyable. Our 12 year old loved it! Climbed via the front route which takes you past the Spearhead. The Spearhead is quite awesome looking when you approach it through the cloud. Decended by the route that takes you to the bealach joining Beinn Ime to Beinn Narnain and then headed back to the car park via main path past the Cobbler. A great walk even though it rained all the way through it. Can't wait to do this one again during nicer weather. Beware if parked in Loch Long car park, it is prone to flooding if there is a higher than normal high tide I would recommend using the higher parking spaces, and not near the beach. My car was written off here after it burst it banks ruined a really good day! After originally planning to do the Cobbler, we turned right at the dam and followed the boggy path to the approach of Ben Narnain. The path could be the remnants of the old Iron Ore mining activities on these hills! 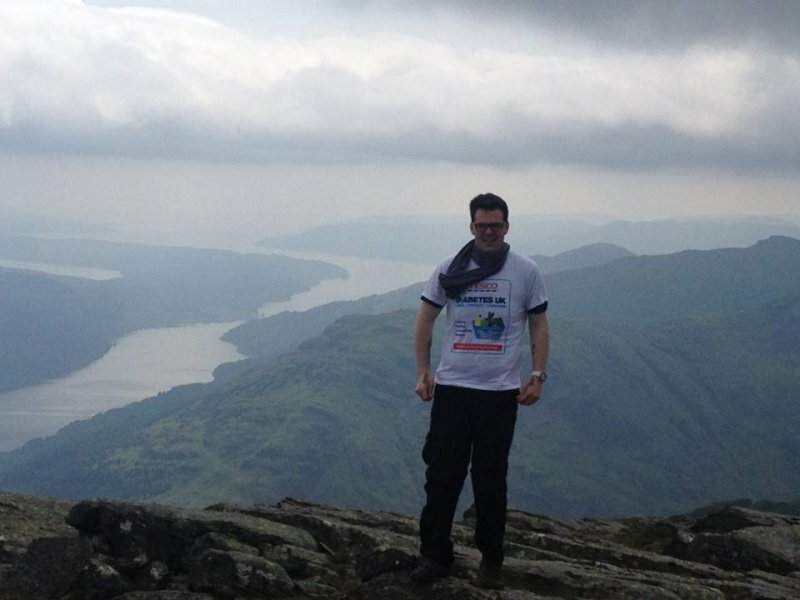 It was a good walk with some mild scrambling in places with great views of Loch Long and the other Arochar Alps.Ben Vorlich and neibouring hills in Lochearn area were clearly visible. 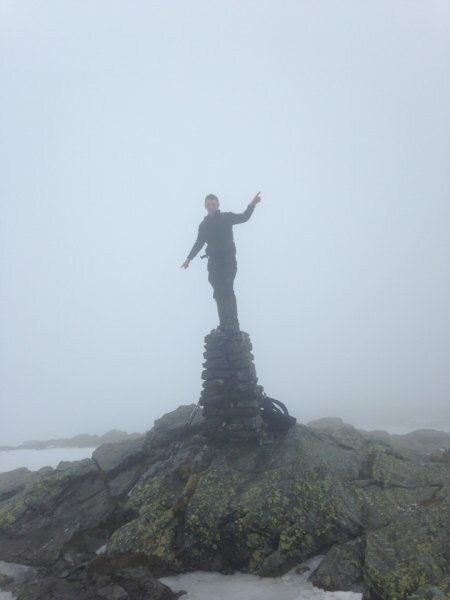 The wind was the problem at the summit.Very strong indeed. The Cobbler was there so on we went to that.Still the best hill in the area despite its Corbett status!